Weed eater. Weed whacker. Line trimmer. Strimmer. Whipper-snipper. Or, as popularly known, string trimmers. They are all the same lawn maintenance equipment and will do the same thing – to cut grass and give your yard a well-manicured look. However, not all string trimmers are the same in terms of their performance and quality. If you are after convenience, it is best to go for one that is cordless. It will offer convenience, making it easy to go around the lawn and trim the grass. Looking for the best cordless weed eater available on the market? Read on and we’ll list down some of the top products that should make it on your list. What is the Difference Between a Curved and Straight Shaft? What is the Difference Between Brushed and Brushless Motor? What is the Difference Between Lithium-Ion and Nickel Cadmium Battery? Is a Cordless String Trimmer Right for You? Ready to start? Our team came up with the list below after spending hours of research. This commercial-grade string trimmer features a powerhead that is capable of accommodating a variety of attachments, making it versatile. It is powered by a 2ah battery that is capable of providing 30 minutes of continuous runtime when fully charged. However, this can easily make you feel tired because it is quite heavy compared to most of its competitors. With the pivoting head of this weed eater, it will edge and trim efficiently even in areas that are hard to reach. It comes with an ergonomic wrap-around handle, which will be great for your comfort. It is also good that it is lightweight, so you won’t easily feel tired even if you have to cover a large area with this tool. A lightweight and user-friendly string trimmer, this will make it almost effortless to get rid of weed in the garden. There is an auto-feed trimmer line, so there is no need for bumping. The trimming head can be customized while the shaft can be extended. The battery, however, as some users noted, can be made better. Another entry from Worx, this can easily convert from a trimmer to an edger, making it a versatile addition to your family of gardening tools. It has an ergonomic handle to make you comfortable while making it effortless to maneuver. The cutting width, meanwhile, can be adjusted from 10 to 12 inches depending on the specific task. Made by a reputable company, this is another versatile product that can quickly transform from a string trimmer to a wheeled edger. It has 2-speed control, so you can choose the level of power appropriate for a certain job. To add, it has Power Drive transmission, which has been developed to provide it with stronger cutting power. With the high-torque transmission, you can be confident that it can handle almost any task. It is even made better by the fact that the power is sourced from the 40 Max lithium-ion battery that features a state of charge indicator to easily let you know how much power is remaining. This way, you will easily know when it is time to have it recharged. This is a string trimmer that is easy to assemble and use right out of the box. It has a 12-inch cutting width, which will allow it to do more in a single pass. The power of this weed eater comes from the 18-volt NiCad battery, which you can also use in the 18-volt tools manufactured by the company. The spool quality, on the other hand, can be improved. It is powered by an ultra-efficient brushless motor, which can help conserve battery without sacrificing its cutting performance. The carbon fiber shaft is known for being durable and lightweight, which has controls that will be easy to access. The battery and the charger, however, should be purchased separately. Equipped with an automatic single-line feed system, you can expect accuracy and sharpness from the cuts it will make. The trimmer head is also adjustable. Meanwhile, it is also a good thing that it weighs only ten pounds. However, some people were disappointed with regards to how power can be underwhelming. So, it is best to limit its use only on small-scale applications. With the brushless DC motor that powers this unit, you can expect superior performance. It has a variable speed trigger that has an ergonomic design, making it easy to control. The head is made of cast aluminum, a material that is known for being lightweight but without compromising its durability. The gear drive design, a patented technology, is one of its best features. It is responsible for making it deliver powerful performance even in a variety of conditions. It has a variable speed trigger, which you can easily adjust using the strategically positioned control switch. The kit, however, does not yet include the battery and charger. This trimmer comes with a cutting width of ten inches, which can be quite narrow for some. Nonetheless, if you have a small yard, this will be more than enough. Because of this, it is also lighter compared to its bigger counterparts. It has a curved shaft, which has an ergonomic design to combat fatigue. The 80-volt lithium-ion battery that you can find in this model is one of the most powerful we have seen. It has a cutting swath of 16 inches, which is also one of the widest from the products we have recommended. It has a brushless motor to deliver unmatched power. Although, if you are brand-conscious, you might not like how the maker is not as popular. This string trimmer comes with two modes, allowing you to choose the right setting for a specific task. The included battery, when fully charged, can have an approximate runtime of up to 70 minutes. Meanwhile, in terms of speed, the maximum is 7,000 RPM. 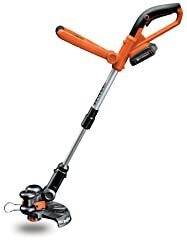 The torque is almost twice compared to a 25cc gas-powered string trimmer. Even if it is powered by a lightweight battery, a lot of its users have noted that it has a power that is comparable to the ones that are powered by gas, making it great even for demanding tasks. The latter can be attributed to its brushless motor. It has push-button controls in strategic locations and are also lit, making it user-friendly. Before we come to a close, allow us to provide quick answers on some of the most common questions many of you might have about cordless string trimmers. The trimmers may be different from each other depending on the design of their shaft. For taller users, the straight shaft is often the preferred option because it makes the string trimmer longer. Also, this will allow you to carry out the task without the need to kneel or bend. On the other hand, the curved shaft is a better choice for shorter users. It is designed in such a way that it will be easier for you to grip and move around. At the end of the day, we recommend that you try the two first and see which one you are most comfortable with. As they say, to each his own. A brushed motor is equipped with another part that rotates around the brushes. This is the traditional design. In the case of modern designs, the motor is already brushless. The latter is the preferred choice for many because it is believed to be more powerful, durable, and efficient. They also require lesser maintenance and can save battery. Most of the string trimmers that we have mentioned in this post are powered by a lithium-ion battery. They are more modern compared to their counterpart. They are also usually lighter and smaller, making them perfect for gardening tools. On the other hand, nickel cadmium battery is bigger and heavier. They also tend to suffer from what is called a memory effect, which can cause a drop in the voltage of the battery throughout the course of its use. As you try to evaluate the options, one term that you will often encounter is cutting swath. Basically, this refers to how wide the string trimmer will be able to cut in one pass. The bigger it is, the more it will be able to cut, making it a great way to save. However, bigger is not always better. There are some instances wherein you will benefit from using a string trimmer with a smaller swatch, such as when there are lots of rocks in the lawn. This way, there is a lesser chance that it will be cutting through the racks. Well, it depends. If you are after portability, this is a good choice. This is right for you if you want one that is lightweight and if you do not want to exert a lot of effort in its use. If it is only for home use and if you have a small lawn, this will be more than enough. However, the problem with cordless string trimmers is that they do not last long. Once the battery drains, you need a spare or wait until it is recharged. And, recharging the battery can take hours. Also, it is not a great choice if you are a pro or if you have a large area to trim. Maintaining your lawn does not need to be a complicated task. Take note of the cordless string trimmer reviews above and learn about the top products to consider. They will make it easier to give your yard a clean look without requiring a lot of effort on your end. Have you used a cordless string trimmer before? Are there other brands or models that you would like to include on our list? Be sure to leave a comment below.